More than four years after a near-fatal brain injury in a skiing accident, Michael Schumacher is still being cared for at home in the quiet Swiss town of Gland on the shores of Lake Geneva. Image Source : AP IMAGE A file image of seven-time Formula One world champion Michael Schumacher. As Formula One drivers prepare for the season-opening Australian Grand Prix next weekend, Michael Schumacher continues a very different fight far away. There remains huge respect for the seven-time F1 champion who, more than four years after a near-fatal brain injury in a skiing accident, is still being cared for at home in the quiet Swiss town of Gland on the shores of Lake Geneva. He's been treated there since September 2014. The thick forest surrounding his castle-like home provides sanctuary from fan and media intrusion with high surrounding walls. While his family fiercely protects his privacy, Schumacher's reputation still towers over F1, and fans of all ages continue to adore him. "What can be said is that the family really appreciates the empathy of the fans," Schumacher's manager Sabine Kehm told The Associated Press by telephone on Friday. "The people really do see and understand (his health situation) is not to be shared in the public eye." The current condition of the 49-year-old German's health remains closely guarded. Kehm would not comment on it when asked by the AP. On March 18, 2012 - exactly six years ago - Schumacher began the last season of his F1 career at the Australian GP in Melbourne. He secured the last of his mammoth 155 podiums that year at the European GP in Valencia on June 24, 2012, before retiring definitively at the age of 43. In his last race Schumacher finished seventh behind Sebastian Vettel. It felt somewhat like a changing of the guard, with Vettel growing up with posters of his German countryman on his wall. 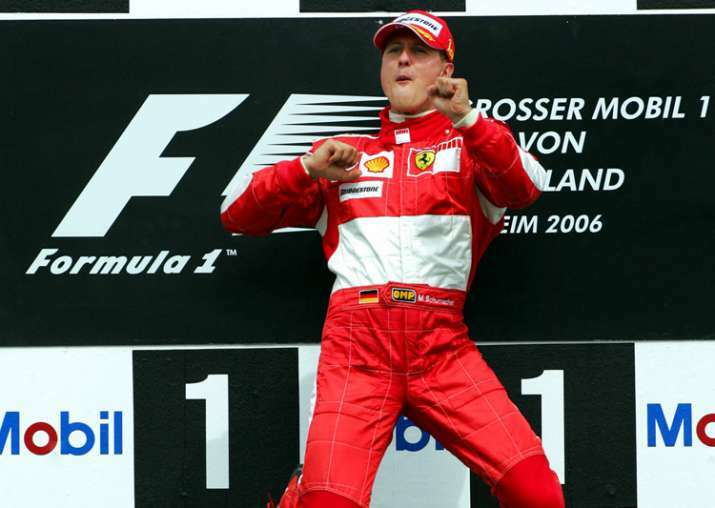 A little more than a year later, Schumacher was fighting for his life. While skiing with his teenage son Mick in the French Alps at Meribel, Schumacher fell on Dec. 29, 2013. He hit the right side of his head on a rock, splitting open his helmet. Doctors worked frantically to remove blood clots from his brain, but some were left because they were too deeply embedded. Schumacher's condition stabilized after he was placed in a drug-induced coma, from which he later emerged. Following his accident, updates went from scarce to non-existent as those around him sought to protect his privacy. Understandably so, amid fears stolen medical records were going to be sold , and unsourced speculation saying Schumacher had slowly started walking again. Reported figures estimated his treatment at more than 23 million euros ($28 million) and counting. The exasperated family stopped communicating altogether. "Michael's health is not a public issue, and so we will continue to make no comment in that regard," Kehm said. "Legally seen and in the longer term, every statement related to his health would diminish the extent of his intimate sphere." That statement was made 16 months ago. On an F1 track near Barcelona this month, a red flag fluttered over a grandstand facing Ferrari's garage. Two words were written on it - MICHAEL FOREVER - in a permanent testimony to his five titles with Ferrari from 2000-4. Schumacher quit F1 in 2006 after finishing second to Fernando Alonso by only 13 points in a bid for an eighth title. When he announced his comeback for 2010, he swapped the flashy red of Ferrari for the gleaming silver of Mercedes. Schumacher's record seven titles and 91 wins made him an F1 colossus. "He was the benchmark of physical approach, of mental approach," said 33-year-old Polish driver Robert Kubica, who grew up watching Schumacher and himself earned 12 F1 podiums from 2006-10. Amid the frenzy of Ferrari's success at the turn of the decade, F1 even threatened to give soccer a challenge for pole position in the hearts of Italian sports fans. In 2000, Schumacher delivered Ferrari its first world title since Jody Scheckter in 1979. "I remember the top audience in Italy on TV was 12 million. He was very popular all over Italy," veteran Italian sports journalist Stefano Mancini told the AP. Mancini, who has covered F1 since 2000 with Turin-based newspaper La Stampa, said "the atmosphere was incredible. Calcio (soccer) is always first, but it was also about Formula One." Even then, access to Schumacher was not easy. Mancini remembers Schumacher as someone who "wanted to protect his privacy" and described him as "shy, reserved." Until it came to karaoke time. During Schumacher's pomp, a handful of Italian F1 journalists would join him on a pre-season ski trip to Madonna Di Campiglio in the Italian Dolomites. They all lodged at the cavernous Golf Hotel. "There was a room with a karaoke and bar," the 55-year-old Mancini said. Schumacher's choice of song is of little surprise. "'My Way,' by Frank Sinatra," Mancini said. "He was a good singer." At F1 pre-season testing in Montmelo near Barcelona, no driver was too busy to speak about Schumacher, amid clear respect for the driver widely considered the best ever along with the late Ayrton Senna. Like Schumacher in his junior days, Lewis Hamilton excelled at karting growing up. Even though Schumacher was by then an F1 star, the lure of going back in time prompted the German driver to compete in a karting race. Hamilton was there, still a teenager. "It was in 2001, and the word was Michael was coming to race ... and he raced in our class," Hamilton recalled. "I just remember being on the track with him and I thought 'That was cool.'" Five years later, Hamilton was breaking into F1 when Schumacher was racing in his then-last season. "I think I was testing, it must have been in 2006. I saw him ahead of me and I thought 'Oh my God, I'm in Formula One and there's Michael Schumacher,'" Hamilton said. "He pulled away from me because I couldn't keep up with him at the time. It was a surreal moment." When the 41-year-old Schumacher came out of retirement, Hamilton competed against him in 2010. "The weather wasn't great. It was wet. I remember pulling into (the paddock) afterward and my car was parked behind him," Hamilton said. "He really spoke to me on the same level and it was just awesome to meet a great." Hamilton is now such a great. He replaced Schumacher at Mercedes in 2013, winning three F1 titles to add to his first with McLaren in 2008. Last season, the 33-year-old British driver broke Schumacher's record of 68 pole positions. He took No. 69 at the Italian GP in Monza: Ferrari's home. Two years ago, Ferrari signed up 20-year-old Charles Leclerc to its prestigious drivers' academy. As soon as he set foot there, the Frenchman, who makes his F1 debut next Sunday for the Sauber team, felt Schumacher's "enormous" influence all around him. "They push us as hard as possible, so we have the same will to learn. He never gave up. I never knew him personally but a lot of people at the (academy) have said that," Leclerc told the AP at pre-season testing. "After four world titles, quite a few drivers would have eased up a bit, but everyone told me that he continued to work just as much, as if he was going for his first. I think that's an enormous strength, it inspires me a lot and I try to reproduce it." As a youth, Leclerc was mesmerized watching Schumacher on television. "Seeing him gave me even more will to succeed and to maybe one day have the same success," said Leclerc, who won the F2 championship in 2017 in some style. "I'm very, very far away, but it makes you dream." Max Verstappen, F1's rising star, is the same age as Leclerc but has already won three races. The Red Bull driver's fearless driving style has drawn early comparisons to Schumacher. His father, Jos Verstappen, was Schumacher's teammate when he won his first title with Benetton in 1994. They became friends, holidaying together with young Max and the younger Mick in tow. Mick Schumacher competed in the European F3 championship last year, securing a podium. Like Verstappen before him, he hopes to follow his father into F1. Schumacher's family appreciates the unfailing support from fans. From June 16 onward, The Michael Schumacher Private Collection - including cars, race-worn helmets and other memorabilia from his F1 days - will be displayed at an old airport in the Germany city of Cologne. "It is to give back to the fans," Kehm said. "To celebrate Michael the racing driver."